What is Australian Rules Football? Where is Aussie Rules Played? When is the AFL Season Played? Australian Rules Football (also "Aussie Rules" or " footy") is a physical contact sport. It is a form of football with roots traceable from early forms of Rugby and Gaelic football, but it is uniquely Australian. Its rules were codified in 1858, and probably predate all other modern forms of football, such as American, Canadian, Rugby Union and League, Association (Soccer) and Gaelic football. Today it is a multi-million dollar business, with a National Competition and numerous smaller leagues. Interest in the game is generally at an all time high within and outside Australia, yet despite this, some parts of Australia are still lukewarm in support of their team in the AFL, and the game has yet to take a firm hold overseas. Where in the World is Aussie Rules played? 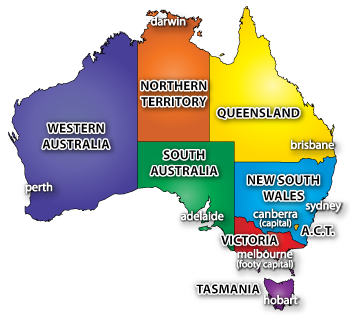 Australia is divided into 6 states and 2 territories. 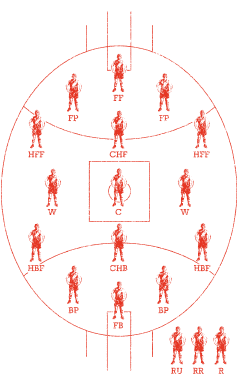 Aussie Rules is the main code of football in Victoria, Western Australia, South Australia, Tasmania, and the Northern Territory and has a strong following in the Australian Capital Territory. Although played in the States of Queensland and New South Wales, it runs second string to Rugby League in terms of popularity in those states. The AFL provides financial or practical assistance to leagues all over the world including Great Britain, Canada, Denmark, Japan, New Zealand, and here in the USA. When is the Australian Football League (AFL) season? Games usually start for the Premiership season in the last weekend of March, and continue through until the end of August. The Finals then start, culminating in the Grand Final on the last Saturday (Friday for the U.S.) in September. A pre-season tournament (the NAB Cup) with the majority of games being played at night, is played from late February to the last week before the regular season begins. Exhibition games are sometimes played overseas between seasons. Saturday afternoon is the traditional game time, but AFL games are played on Friday nights, Saturday afternoons and evenings and Sunday afternoons and evenings. Games are occasionally scheduled on Monday nights and on public holidays. To watch AFL live from within the U.S., check out www.espn3.com. The team scoring the most points wins the game. The match is considered drawn if points are equal. A game is divided into 4 quarters of 20 minutes playing time. Time is kept on the field by the umpires. When play is unduly delayed, such as the ball going out of the playing area, time is added on to the playing time of the quarter as it is in soccer. This is referred to as 'time on'. The teams change ends at the end of each quarter. A maximum interval of minutes is allowed between the first and second quarters for the teams to change ends, and five minutes are allowed between the third and fourth quarters. Half-time is a maximum of 20 minutes long, with players being allowed to leave the ground for not more than 15 minutes. 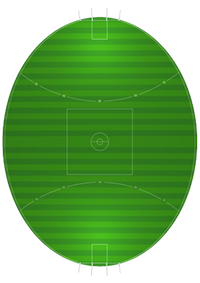 Aussie Rules is played on cricket ovals; thus, there are no standard dimensions for a football field (usually called "ground" or "paddock"). The field should be an oval between 135 and 185 meters in length and 110 and 155 meters in width. (The Melbourne Cricket Ground is considered an ideal surface; its dimensions are 165m length by 135m width.) The boundary is marked with a white line drawn a few meters from the stands. The goals are two sets of posts erected at the far ends of the oval. The inner set of posts is the goal posts, 6.4 meters (roughly 7 yards) apart on the boundary line, and at least 6 meters tall. Two behind posts are set 6.4 meters from either side of the goal posts on the boundary line, and must be at least 3 meters tall. All posts must be padded to a height of 2 meters. A goal square (actually a rectangle) extends 9 meters into the ground from the goal posts, and is 6.4 meters in width. A radius is drawn on the oval 50 meters from each goal. This merely serves as a range finder; any AFL player should be able to kick a goal from this line, and perhaps beyond. The center circle is marked at the precise center of the oval, 3 meters in diameter, bisected by a lateral line extending 2 meters either side of the diameter, and dividing the field in half. A center square is centered on this, 45 meters on each side. These markings control the conduct of center bounces, as will be seen later. The ball is an oval bladder covered with leather, tanned for day use or colored visible yellow for night matches, and inflated to 69kPa (10 lbs) pressure. It is slightly larger and rounder than the American or Canadian ball, as it was not designed to be thrown. A team consists of 18 players; three interchange players (substitutes) are allowed on the bench. Free substitutions are allowed at any time during the match, through a "gate" in front of either bench. Players are deployed in five lines of three across the oval, with the remaining three assigned to the ball. The three assigned to the ball are referred to as "followers." Their positions are referred to as Ruckman, Rover and Ruck-Rover. Although the players have designated positions, they are free to move anywhere on the ground when play is in progress. There is no "goalie" in Aussie Rules. No padding is worn. Mouthguards, soft protective headgear and shin guards are permitted. Other protection or medical appliances require prior approval; generally, you can't play in a cast or heavy knee braces as you can in the NFL. Jewelry is prohibited as a health hazard. A ball kicked between the two larger goal posts without being touched is a goal and scores six points. The ball is returned to the center circle for a "ball-up." If the ball passes between the behind posts by any other means, then it is a behind, and it scores 1 point. If the ball hits the goal post, a behind is scored. This is regardless of where the ball goes after hitting the goal post, e.g., back into the field of play, through the goals or whatever. If the ball is forced, or carried, but not kicked over the scoring line anywhere between the goal posts, a behind is scored. The ball is kicked back into play from within the goal square, usually by the opposing fullback. If the ball hits a behind post without bouncing it is deemed "out on the full" and the opposing team takes a free kick from next to the behind post. If the ball bounces and hits the behind post then the ball is thrown into play again by the boundary umpire from next to the behind post (see (b) under "Starting and Restarting Play" below). In either case, no points are scored. Teams determine the initial choice of goal by coin toss. The field umpire starts play by blowing his whistle and bouncing the ball in the center circle so that it rebounds vertically to be contested by the players in the center square. If ground conditions won't allow the ball to bounce, the umpire simply tosses the ball into the air as if it were a "jump ball." At a center bounce, no player may enter the center circle or cross the center line into the opponent's side of the ground, and only four players from each team are permitted in the center square, until after the ball has been bounced. After a goal is scored, play is restarted in the center of the ground in the manner described above. After a behind has scored. Any player of the defending team kicks the ball from within the kick-off 'square' in front of goal, but only after the goal umpire has finished waving his flags. The player must kick the ball out to restart play. You may observe, however, that there is no rule preventing him from kicking the ball to himself. After the ball has gone out of bounds (outside the boundary line). If the ball bounced, then the boundary umpire restarts play by throwing it backwards over his head towards the center of the ground. If the ball did not bounce and went over the boundary line as a result of a kick that was not touched, it is "out on the full" (on the fly), and the opposing team receives a free-kick from the spot at which the ball went out. The closest player from the opposing team takes the free kick. When a pack of players prevents either team from gaining clear possession, or a player being tackled or held fails to dispose of the ball ("holding the ball;" see "Possession" below). The umpire bounces the ball at the spot where play came to a halt. A goal is scored. Time is stopped from when the goal umpire finishes waving his flags to when the ball is bounced. A behind is scored. Time is stopped from when the goal umpire finishes waving his flag to when the ball is kicked in. The ball goes out of bounds. Time is stopped from when the ball goes over the boundary line until the boundary umpire throws the ball back into play. Whenever the field umpire signals to the time-keeper that time is to be stopped by raising his arm and blowing his whistle. A ball that has gone completely over the boundary line is considered out of bounds. If any portion of the ball is on or over the boundary line, the ball is still in play, as it is in soccer. A player can be over the boundary line and in possession of the ball without the ball being considered "out of bounds" if part of the ball is still in play. A player may hold the ball for unlimited time when he is not being held by an opponent. A player lying on or over the ball is considered to be in possession. To handball correctly, a player must hold the ball in one hand and hit it with the clenched fist of the other hand. The hand holding must not move relative to the player's body. (Correct technique is sometimes more honored in the breach than in the observance.) Overhand passing is not permitted. A mark is allowed when the ball is caught from a kick which has traveled a minimum distance of 10 meters, and the ball has traveled in the air without being touched by another player. (The ball usually doesn't have to be held for very long, especially in a physical marking contest; and yes, anything goes as long as both contestants are going for the ball.) The player taking the mark may play on immediately, or go back and kick over the position where he took the mark. A player may retard the movement of an opposition player towards that of the ball, however it may only be done within 5 metres of the ball. Shepherding allows the opposition player to be pushed in the chest or side, or for the player to place his body between the opposition and the ball (when the player himself is not in possession of the ball.) Comparable to screens in basketball or blocking in American Football. Not disposing of the ball within a reasonable time when held by an opponent. Not disposing of the ball correctly by using a handball or a kick. Kicking the ball over the boundary line without it bouncing first or being touched by another player. Deliberately forcing or taking the ball over the boundary line. Running more than 15 meters without bouncing the ball or touching the ball on the ground. Grabs the opponent with the ball above the shoulder or below the knees. Pushes an opponent in the back. Trips or attempts to trip an opponent. Interferes with an opponent attempting to mark in the air by punching or bumping. Shepherds an opponent when the ball is more than 5 meters away. Enters the center square before the ball is bounced at the restart of play. Refuses to stand on the mark at the point indicated by the umpire. Deliberately wastes time in returning the ball to the player who is to take the kick. Holds the player who is to take the kick thereby preventing play continuing. Runs over the mark before or as the ball is kicked. (Any player in the opposing team can give this penalty). If a ball is kicked back into play from the goalsquare, following the scoring of a behind, and subsequently goes "out of bounds" without being touched by a player of either team despite bouncing, it is treated as if having gone out of bounds on the full. The attacking team is awarded a free kick. An umpire need not hold up play by awarding a free kick to a player who has been infringed. Where the player or a team-mate has possession and is in an advantageous position, the umpire calls 'play-on' and allows play to continue. This is referred to as 'paying the advantage'. A player who is infringed upon, immediately following the disposal of the ball, may have a fellow teammate take the free kick from the spot where the ball landed after being disposed of. This is at the umpires adjudication.